At the beginning of the 4th quarter and as part of our strategic plan, Duggan embarked on a full rebranding from the ground up. One part of the collaborative effort entailed talking to a large number of our customers, our suppliers and our employees to learn about their experiences with our company from their unique perspectives. So what did we learn? Our customers, our suppliers and our people have and always will be our key to success. 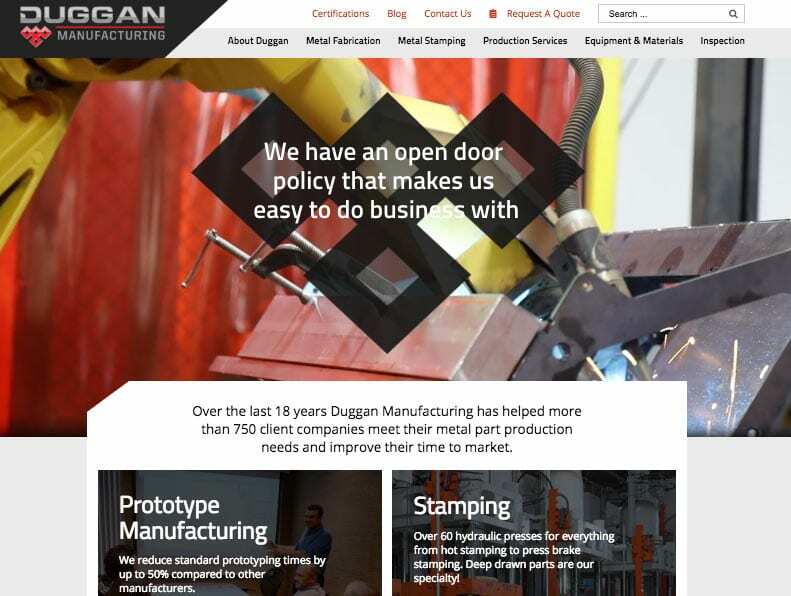 Our customers are impressed with the skills and expertise of every individual person at Duggan and at how many different processes we do here. The amount of equipment in this facility is a key feature when customers first select us. We were also told that they like our openness and flat management structure that allows them to get answers when they have questions. Our suppliers that we choose are the best in the industry because they are experienced, aggressive, respond quickly, and assist us in accelerating the speed in which we create our parts. Our team members (many of whom have been with us for over 7 years) are happy that they learn and grow different skills inside our company. They not only appreciate the outside training but also the investments that we make in our equipment and facility. They are very proud with the growth of the company and the knowledge that their contribution plays a big part of it. We dug deep, did our homework and worked hard to build our new brand. We are proud of the results and our new brand essence statement—Elevate and Accelerate from Prototyping to Production. It captures our drive and passion to improve the prototyping and production process. By making the parts correctly or improving the parts with design suggestions we elevate the customer experience. When we compress time for our customers, we accelerate their ability to get a new product done and out the door. We have put our internal and external communications under a microscope to explore what was working and what could be improved. Our most visible and used communication tool is our website, of which you are now visiting. We found that with so many capabilities under one roof, we needed to show more specific, statistical information about each capability and service. This includes everything from the exact equipment, to the materials we can handle, with details such as part sizes, metal thickness, and the range of certifications clearly defined. Through this, we now have a good representation of who we are, how we do it, and what we can do for you. Our purpose or ‘why’ has not changed, which is to be the best prototyping company in the world. Our track record shows that what we do is working, as we have grown from an 8 person shop to over 100 team members, not to mention our long list of satisfied customers. We are now able to communicate and articulate it better. If you are already one of our customers, or if you are thinking of becoming one, explore our new website or give us a call. We would enjoy hearing from you.